Open at 5:00pm. Show at 6pm. Reservations accepted. Open at 7:00pm. Show at 8pm. Reservations accepted. Open at 7pm. Show at 8pm. Open at 6pm. Reservations accepted. Contact restaurant. ** Subject to changes. Contact restaurant with any questions. 2 hour Street Parking is available on West Broadway in South Boston until 6pm Monday - Saturday. After 6pm or on Sunday, the 2 hour parking limit is not enforced. Additionally, there is a public parking lot next to the Bank of America building that is also 2 hour parking until 6pm. Bus stops at F Street and West Broadway and at East Broadway and West Broadway. Please contact the restaurant to inquire about private events. Capo offers a full catering menu. Catering menu is available on our website. Tucked underneath Capo Restaurant, the Supper Club looks to recapture the excitement of going out on the town for dinner and a show. The Supper Club at Capo is a 4,000sf subterranean lounge located next door to Capo Restaurant and below Citizen’s Bank. 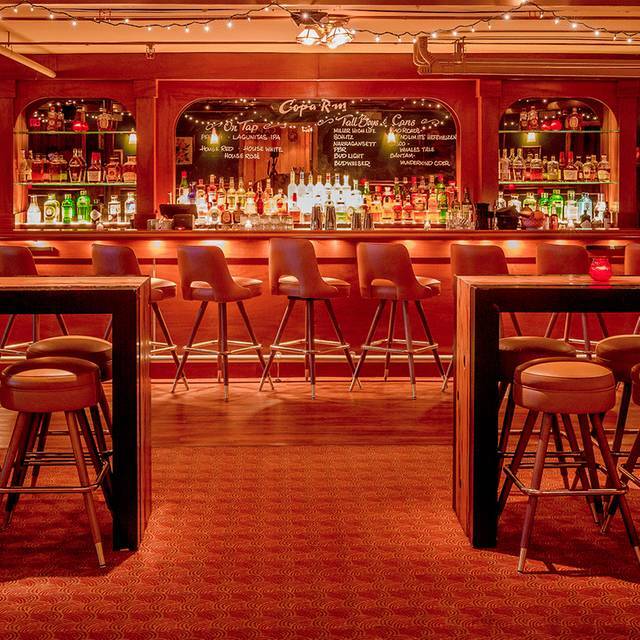 The Supper Club is accessible through a connecting staircase located in Capo’s dining room at 443 West Broadway. There is a private entrance located at 439 West Broadway which is available for private events only. The Supper Club at Capo consists of a 40ft bar, a large performance stage for live music and entertainment, a stage-front dance floor with two retro stage-side lounges. Follow us on Facebook to stay up to date with our current live music and entertainment schedule. join us for brunch! 11-3:00 sat. & sun. This was date night with my wife. Pleasantly surprised. Located in the basement of the Capo Restaurant you get the feeling of being in a speak easy. Our waitress was awesome, the food was delicious and the entertainment wonderful. Highly recommend Sunday Night Sinatra at the Capo. Looking forward to trying other shows and also just the restaurant. The food and service was very good and the Sinatra band was outstanding. We had a great time and will definitely be returning. Loved it! Great food and entertainment! No bad seats! Went for Sinatra Sunday and had a wonderful time. The ambiance was right on for a date night and the live band was fantastic! I would go again. Capo food is delicious. Supper club was really nice! Dinner at Capo's Supper Club for Sinatra Sunday was so much fun! We've been to Capo quite a few times, sometimes for dinner, sometimes just for a drink, a couple times downstairs for dancing and live music, but Sinatra Sunday gave Capo a whole different vibe. The low lighting, smooth music, general crowd, and food, made for the perfect date night spot or night out with a group looking to avoid the typical bar scene in Southie. It was fun and relaxed, but the music really brought it next level. The band was awesome and the food (as always) was tasty. 10/10 would recommend and I will be returning with friends! Loved the dinner show!!!! Was amazed at the upstairs bar/restaurant too. Fantastic place!! We had a wonderful time at Cape. The food was excellent and the atmosphere was perfect for Sinatra Sunday. We'll definitely be back. I took my boyfriend air as a surprise for a special occasion we were celebrating. He loved it. We went for Sinatra Sunday and got to enjoy the show while we had dinner. The food was delicious. I was even invited on stage to sing a duet with Rick. It really made our night special. The Ron poster band is awesome. The Frank Sinatra show was excellent! Loved the music! Very talent group of musicians. It was really fun. The food was average. The ambiance could use a little updating to make it more authentically Sinatra. Great night out! Rich and his group are fantastic! Great to experience something different! Our night at Capo was great! Me and my friend attended a comedy night there and everything was awesome! Delicious food, good drinks, great service and so much fun with the comedians who kept us entertained the entire time! I highly recommend this place! My wife and I were on a date night and we attended Sinatra night on Sunday and it was fabulous. We had a really nice time. Food was good and the entertainment was excellent. Loved the big band sound and the ambience was perfect. We will definitely be returning and would highly recommend. The Sinatra performance by Rich DiMare was amazing. He has a great voice and an amazing stage presence with the help of the band. Our server Jules was fantastic. She was very knowledgeable about the menu, offered suggestions, and literally bent over backwards to not disturb the show. An enjoyable night for everyone. Best night at Sunday Sinatra!!! Molly is the best! The entertainment was wonderful and the ambience was romantic. I would definitely visit Capo Supper club again. Sinatra Sunday was such a fun date night and the singer was great! very interactive with the audience so go prepared with your favorite Sinatra songs! I Took my 4 girls ages 21-26 to the Sinatra Sunday impersonators. They LOVED it!! The music, the band, the vibe, our amazing server Molly. It took an out-of-towner like me to find this amazing gem. They are all going to go back. Awesome comedy and great food! What a fun space! Haven't been to a place like this in years, with a live Sinatra-era quartet, a dance floor, and good food. Great ambiance. Sinatra Sunday was fantastic, we loved the food, music and full experience! So happy to have discovered this! We went and enjoyed a free comedy show on Monday night. The comics were funny! I’m glad we checked it out. We would definitely come out again. The service and food were great. It was a great chill and fun evening. The live music playing Sinatra covers was great and the comedians were funny. The food was delicious. I had the bronzino which was very flavorful and fresh. I took my parents for Father’s Day and they had a great time. We went for Mother's Day to the show. It was GREAT! The food was delicious. Highly recommend. It's a fun Sunday out. We went for our 28th anniversary and still rave about this place. First off..it is HUGE! Still very inviting. The upstairs was beautiful, but we came for rhe supper club comedy nite. We did not anticipate the amazing food! Just. WOW! I hade the seared scallops with pesto premivera rosotti. Soooo good! Hubs had short rib ravioli w smoked pueed potatoes. Again, soooo good! Lots of food too! We will most def be going again and recommending to all who listen! The only thing that we would chane is the chairs in the supper club. While adorable, they were super hard on our old backs. Brought my boyfriend and his family to the Supper Club for Sinatra Sunday. Our table was near the stage and couldn’t have been more perfect. The music was great and the setting was better. Felt like we were on a movie set. Highly recommend Sinatra Sunday to anyone looking to do something out of the ordinary. Comedy night was awesome! Highly recommend, I was in tears the whole night! 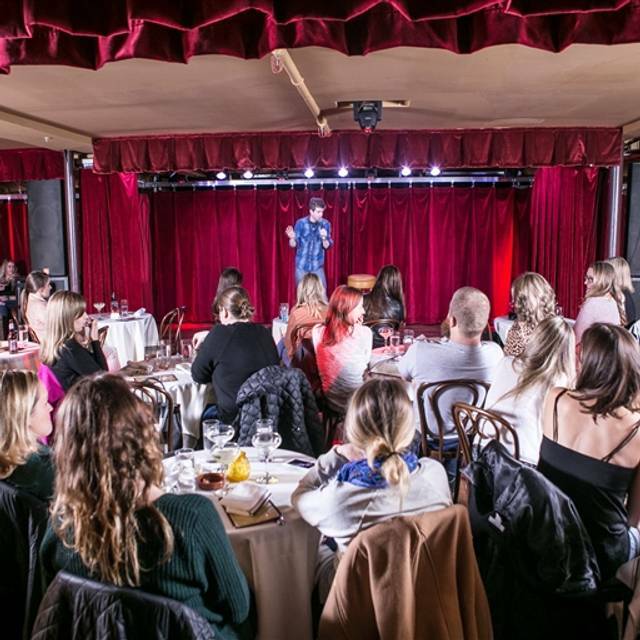 We've been to Capo basement, Supper Club, many times for late night drinks and live music but recently went on a Monday for comedy night and WOW, what a fun experience! The food was great (they even had the upstairs menu available) and we had the meatballs, arancini, prosciutto flatbread, bolognese, two bottles of wine and... EIGHT comedians later, we didn't want to leave. The show was free and I would recommend going on a Monday to anyone! We will be back. **My husband said it was the best date we've ever had! !